I finally finished the car project that I started on the way to North Dakota– since then it’s been down through Kansas City, MO, back to TX and to Oklahoma and back. It is my second takes on a quickie pattern I wrote for Yarnivore, which I call the Fiesta Scribble Shawl. And I should mention, it’s knitted. The basic idea is to take two yarns- one fine, one worsted or chunky, and knit a few rows in the fine one and then one row in the chunky. 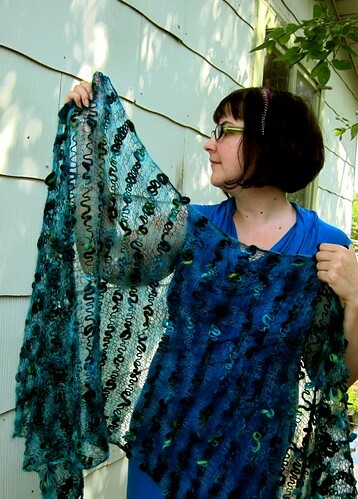 This technique is called scribble lace and I did not invent it nor am I claiming to, but this pattern explains how I made the store sample and shawl above. I knit my first Fiesta Scribble Shawl back in April of 2010 (prime Fiesta season for us San Antonians) using Colinette Parisienne (a mohair blend) and Giotto (a ribbon yarn). When I saw a sample of a new yarn called Colinette One Zero sitting behind the counter last month, I absolutely fell in love with it. My boss must have seen the forlorn look in my eyes because she let me have it. I took it home to pet and ponder, and realized it matched a skein of Parisienne I had purchased when I first started working at Yarnivore. It was a yarn pairing made in heaven, and so, I began to knit my second shawl. I know this photo is sort of ridiculous, but it shows you my deep love for this shawl. Of course, halfway to North Dakota I realized I had nowhere near enough mohair to finish it –I had previously crocheted a shawlette with most of the ball- and I tried ripping it out but there was no. freaking. way that was going to work. I searched around and was able to get another skein on e-bay. I enjoyed every minute of knitting this shawl, the thick and thin wool was great and scribbly and fun– it tamed somewhat with blocking but is still delightfully artsy, and the softness of the yarn is divine. This is definitely a project where I really enjoyed the process and the product. Sure, it can get mind-numbingly boring to knit stockinette, but it’s a great project to pull out when you don’t want to think. It’s nice to let the yarn do the talking once in a while. 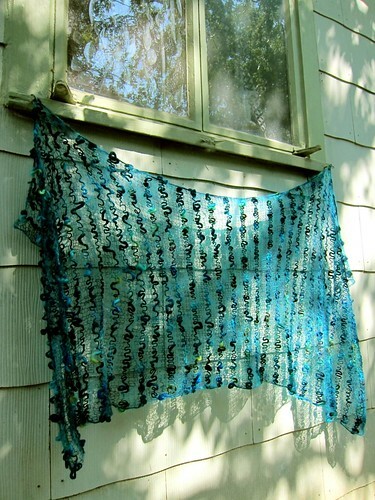 The Fiesta Scribble Shawl is whisper thin and great for travel- scrunch it up in your suitcase and take it anywhere. Give it a shake, and it’s a shawl; wear it around your neck, it’s a scarf. I thought I’d finally share the pattern here on my blog for those of you who don’t live near enough to come find yarn at Yarnivore. Picking out yarns for this shawl is fun no matter how many times I help a customer with it. 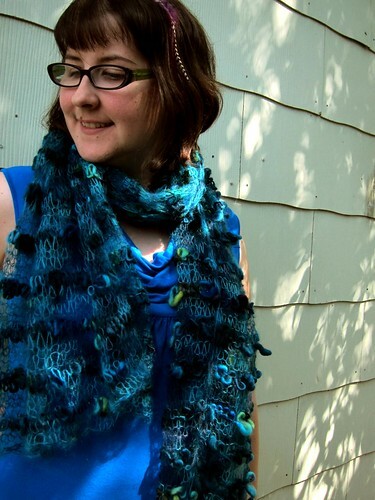 If you end up making one, I’d love to see a picture on Ravelry. Enjoy and feel free to share! *Any mohair or thin yarn will work, but you need all of the 240 yards to make a shawl the same size as the finished measurements. If using slightly shorter yardage, cast on 10 fewer stitches for a 20″ wide shawl, or buy 2 balls of mohair. 24″ US #15 (10 mm) circular needles OR size to obtain gauge. Note: I am the loosest knitter in the shop, so you may want to go up to size 17 needles. FINISHED SIZE: 24″ wide by 64″ long. GAUGE: 9 sts worked over 9 rows measures 4″/10 cm square using stitch pattern below. Gauge is not critical BUT you will need to match the gauge closely to end up with the same size shawl without running out of yarn. TIP: Mark the knit side of the shawl with a marker so you’ll know at a glance which type of stitches you should be working (marker facing you= knit, marker on reverse side=purl). After a few rows, it will be easy to “read” the stitches, but it can be confusing at first, especially for beginners. With A, cast on 54 stitches. Row 1: Change to B, knit. Row 5: Change to A(carrying it loosely up the side), knit. Row 6: Slide work across to opposite needle, switch to B, knit. Row 10: Slide work across to opposite needle, switch to A, purl. Repeat Rows 1-10 until you are almost out of B. Ending on a Row 4 or Row 9, switch to A and bind off, weave in the ends. Wet block to finished measurements and let dry completely. 24″ US #15 (10 mm) circular needles OR size to obtain gauge. Note, I am the loosest knitter in the shop, so you may want to go up to a 17. Repeat Rows 1-10 until you are almost out of B. Ending on a Row 4 or Row 9, switch to A and bind off, weave in the ends. Thank-you. I did a stretch bind off and am now dealing with the edges and the ends of the bulky yarn. I tried fringe but it was too heavy. I am thinking of french knots for those ends and some kind of decorative edge. Hmm. All in the design challenge. Thanks again. 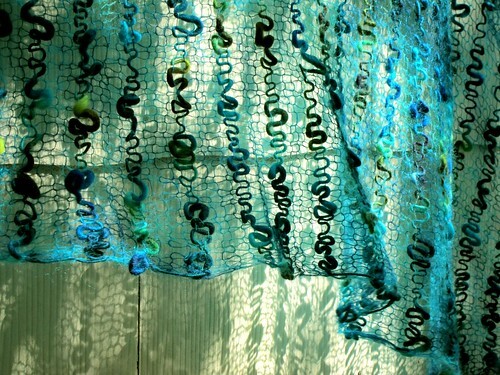 I am making one of these right now is cream and bright for my future daughter in law. I am ready to bind off and now have finishing questions. One, do I just do the old fashioned bind off? (I did a stretch cast on.) Two, I cut the larger gauge bright white yarn instead of running it up the side. I am wondering about possibly knitting a decorative edge like i-cord or if I can actually weave in the ends of the bright white in a way that will look clean. Hi Pamola- I just did an old fashioned one-over-one bind off, keeping the stitches loose- you can do whatever you like (maybe a sewn bind off would maintain the stretch like your cast on)? As far as weaving in the ends...yeah, I'm not sure how to do so without them showing a lot which is why I carried the yarn instead, but your icord method could work. It might be bulky though, so another option is to do a row of single or double crochet (if you know how), or really any decorative stitch along the edge and work over the ends. This is beautiful! Thanks for the pattern!